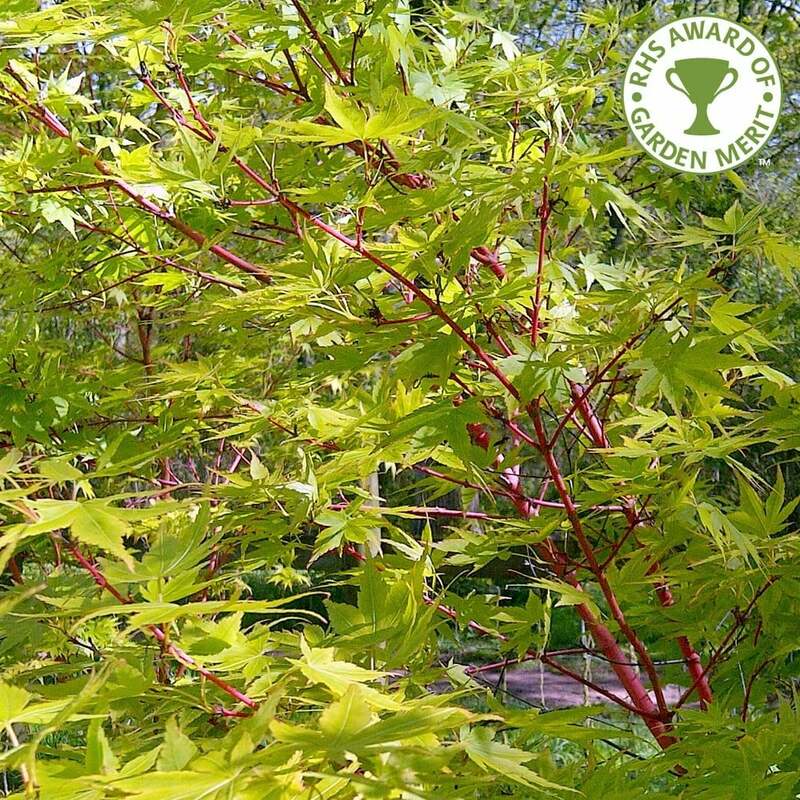 Acer palmatum 'Sango-kaku' is the most well known Coral Bark Maple tree and has the RHS Award of Garden Merit. Acer palmatum 'Sango Kaku' produces bright coral pink young growth and yellow/orange, deeply lobed new foliage in the spring which turns to a lush green in summer and then striking soft yellow in autumn. Once the explosive foliage display is over, the bare branches of 'Sango Kaku' make a stunning focal point in the winter. Triggered by a cold spell, the stems and bark turn a vibrant coral pink-red. Offering year round interest, Acer palmatum 'Sango Kaku' makes the perfect feature tree for a sheltered position avoiding heavy, waterlogged soils. This red barked Maple will grow to approximately 4 x 2 metres in 20 years. For a very similar but smaller variety consider Acer palmatum Winter Flame or for a larger tree, Acer palmatum Beni Kawa. Pot grown Coral Bark Maples can be planted at any time of the year. Choose a spot that avoids avoid heavy, waterlogged soils and remove all weeds and grass within a metre of it. Dig a square hole as deep as your root mass and approximately 2x as wide. To help your tree establish more effectively, we advise sprinkling root grow in the hole, especially if you have poor soil. When planting Coral Bark Maples, use ericaceous compost when possible as this encourages vibrant foliage colour. Using 50% of the original soil and 50% compost, fill in the hole and firm around gently. Make sure not to bank the soil up around the collar of the tree as this can cause problems. If you’re planting Coral Bark Maples in spring or summer, water well and regularly for the first few months. If you’re planting in autumn, you may only need to water a little. Keep an eye on young trees and increase watering if there are extended periods of hot or dry weather. If possible, use rain water instead of tap water as this is more acidic and better for foliage colour. We stock a range of irrigation kits for more effective watering. Pruning should be carried out in the dormant season, from November to March. Japanese Maple trees bleed during other times of the year so pruning can weaken the branches. However, Japanese Maple trees very rarely need pruning. The natural shape is normally the most attractive and pruning should be carried out with a less is more approach. Only remove, crossing, damaged or diseased branches. Do not coppice Corak Bark Maple trees.